I am a funder or philanthropy network. How can using Foundation Maps help me in my work? I am a consultant to a funder. How can using Foundation Maps help me in my work? I am a nonprofit and/or fundraiser. How can using Foundation Maps help me in my work? Can I take a peek inside Foundation Maps? What is the source of data in Foundation Maps? What are the criteria for the data set? How often is the data on Foundation Maps updated? How much is a subscription to Foundation Maps? What are the minimum system requirements to run Foundation Maps? 1. What is Foundation Maps? 2. I am a funder or philanthropy network. How can using Foundation Maps help me in my work? See broad trends at glance and monitor changes across the sector. Explore who else is funding in your areas of interest, including subject, geography, population served, type of support. Get detailed information about the grants and grantmakers that already support your current and prospective grantees. Go beyond who you already know in the field and discover new partners for collaboration and community. Chart your funder’s giving data to assess funding portfolios and plan for the future. Create maps that demonstrate the scope and reach of your philanthropy — worldwide or in your own community. Combine the knowledge and visuals from Foundation Maps to craft a powerful narrative about your organization. 3. I am a consultant to a funder. How can using Foundation Maps help me in my work? Foundation Maps can help you stay ahead of the curve and have a solid understanding of trends in the field. It offers the breadth and depth of knowledge you need to be strategic, persuasive, and effective by providing insights into to your clients’ program areas and funding priorities. Foundation Maps is also a powerful asset for every part of your consulting assignment, from saving you time in the discovery phase to helping you illustrate your work and support your recommendations. 4. I am a nonprofit and/or fundraiser. How can using Foundation Maps help me in my work? Find funders in specific regions that work on the issues you care about most. See which funders have a history of funding nonprofits like yours. Explore giving trends over time. Customize your searches with advanced filtering tools, including organization name, grant amount, grant years, population served, type of support, grantmaker type, and keyword. a deeper understanding of why a particular funder may be a good match for your mission. maps and charts that demonstrate the need for funding in your region or subject area. evidence and images that communicate your place in the sector and support your case for funding. 5. Can I take a peek inside Foundation Maps? Sign up for a Free Trial and view our Guided Tour videos for a sneak peek inside Foundation Maps. 6. What is the source of data in Foundation Maps? Foundation Center compiles data from a number of sources, including direct reporting of grants by funders, IRS information returns (Forms 990 and 990-PF), funder web sites, and other public sources. In all, Foundation Center's staff monitors more than 35 diverse information sources to verify the details in our databases. 7. What are the criteria for the data set? The Foundation Maps data set includes funding 2006-present in support of all subject areas. When such information is available, grants are organized by population served, type of support, and geographic area served. At launch, this included information on more than 3.5 million grants totaling more than $220 billion. 8. How often is the data in Foundation Maps updated? The data set is updated weekly as new data becomes available. Funders that wish to submit grants data to Foundation Center are encouraged to join our Electronic Grant Reporting program. For more information, e-mail us at egrants@foundationcenter.org. 9. How much is a subscription to Foundation Maps? Learn more about the different plan levels, including pricing, and purchase a subscription. 10. Are custom options available? 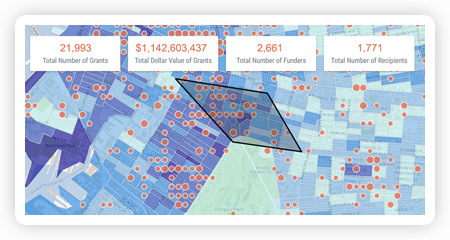 Foundation Maps is also a platform for custom maps for individual funders and philanthropy networks. Submit a request for more information and pricing on custom Foundation Maps, or e-mail us at maps@foundationcenter.org. For more information about Foundation Maps, please contact maps@foundationcenter.org. 12. What are the minimum system requirements to run Foundation Maps? To run Foundation Maps, you'll need a reliable Internet connection and one of the following browsers: Chrome, Firefox, Safari, or Internet Explorer 10 or higher. Foundation Maps is designed to be responsive on a variety of screens, including tablets. Bug fixes, updates, and new features will be released periodically.